Robust steel grid deck sleep surface provides superior mattress support and easy to clean surface compared to traditional spring decks. Head and foot sections can be raised or lowered simultaneously or independently with one hand control. 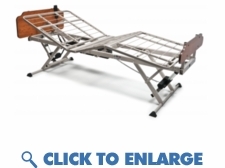 Recessed main frame offers maximum pinch point protection between grid deck and frame – reducing the risk of injury Lightweight design weighs only 126 lbs – lightest bed on the market Bed setup is so simple that it can save on setup time and requires minimal maintenance keeping your technicians time efficient. Features dual HI/LO motors to adjust bed height from a low 10" to 20" easy and even allows for trendelenburg and slant positioning Patent pending rail slots in frame ensure quick and proper rail placement Single motor unit is designed for easy installation, requires less maintenance and provides the ultimate in quiet, smooth head and foot articulation Attractive, “home-like” thermo fused bed ends offer a less institutional look and eliminate a bed component that often requires frequent repair and maintenance Features SilverSolutions- an anti-microbial technology built into the paint that protects against bacteria and odor. During a power failure, the motor can lower both the head and foot section with just a single 9 volt battery 4" extension kit can be installed on head, foot or both to extend bed length to 84" or 88" Proudly made in the U.S.A. Robust steel grid deck sleep surface provides superior mattress support and easy to clean surface compared to traditional spring decks. Head and foot sections can be raised or lowered simultaneously or independently with one hand control. Lightweight design weighs only 126 lbs – lightest bed on the market Bed setup is so simple that it can save on setup time and requires minimal maintenance keeping your technicians time efficient. Features SilverSolutions- an anti-microbial technology built into the paint that protects against bacteria and odor. During a power failure, the motor can lower both the head and foot section with just a single 9 volt battery 4" extension kit can be installed on head, foot or both to extend bed length to 84" or 88"